The Ann Arbor Fire Department might be spared from cuts for the next six months under a new deal reached between the firefighters union and city leaders. City officials say a tentative agreement is in place that could postpone layoffs scheduled to take effect next week. The agreement covers the one-year period from July 1, 2009, through June 30, 2010. Several members of the firefighters union showed up at the Dec. 21 Ann Arbor City Council meeting to protest firefighter layoffs. Union officials told their members Monday that the contract language is being finalized and will be released within the next week. The details remain confidential. A 14-day period will begin once the final language is released so union members can review the tentative agreement prior to a ratification vote. City Administrator Roger Fraser confirmed this morning the city is postponing the potential layoffs pending Local 693's ratification vote on the tentative collective bargaining agreement. He indicated he was happy with the agreement. "We wouldn't have a tentative agreement if we didn't think we got as much as we could out of it," he said. Fraser announced plans earlier this month to move up the previously scheduled elimination of 14 firefighter positions. Laying them off in early January instead of late June could save about $400,000, which was one part of Fraser's solution to close a $3.3 million mid-year budget deficit. Matt Schroeder, president of Local 693, said he's not at liberty to talk specifics. But he said the concessions being made by the firefighters union amount to more than the $400,000 mid-year savings Fraser targeted with the layoffs. "It's a lot more than $400,000, and ultimately we'll see what our body says when it comes up for ratification," he said. "We felt that we owe it to the citizens to at least give this a try because we believe we're already minimally staffed. I don't know that it can make it past ratification but we're going to try. It's an opportunity to allow the fire department to move forward for six months." Mayor John Hieftje recently issued a challenge to all the city's labor unions, asking them to take a voluntary 3 percent pay cut to help the city balance its budget. Schroeder declined to give a specific percentage but said the firefighters will have answered the mayor's call if the tentative agreement is approved. 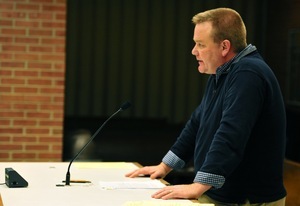 "Our local is being a leader in this whole proposition, and I would look to administration to follow our lead with some of the givebacks because I think that they need to be looking at themselves," Schroeder said. "We'll be encouraged by other people in administration that follow our lead." The firefighters union offered to make major concessions two weeks ago, including a 6 percent reduction in wages and benefits. But no deal was reached at that time because the union wanted a guarantee of no layoffs. One of the 14 positions to be cut was vacant, so 13 firefighters received layoff notices this month. They were to be terminated effective Jan. 4. The fire department currently operates on a budget of about $14 million a year, the bulk of which goes to wages and benefits for firefighters. Right now, the department is budgeted for 94 full-time employees, which includes two management assistants and the chief. In 2001-02, the department had 113.5 full-time equivalent employees. The last contract for Local 693, which expired June 30, contained a no-layoff clause that has protected the fire department for the last five years. But city leaders say they now have little choice but to dig into public safety as they confront a multimillion-dollar budget deficit heading into next year. If the tentative contract is ratified, Fraser said he anticipates negotiations with the firefighters union will resume in the spring to talk about what happens after June. He already has asked the department to come up with a plan to trim an additional $1 million from its budget. Craig Ferris, a lieutenant who has been with the fire department for 16 years, spoke out at the Dec. 21 City Council meeting. He believes the department already has been reduced to minimum levels, and further cuts pose a safety risk. As labor negotiations continue, city officials are in the final stages of sorting through five candidates for the fire chief position, and two of those candidates apparently are being invited back for second interviews. Chief Samuel Hopkins retired in September, leaving the city looking for a new leader to steer the department through a stormy period of financial uncertainty. The candidates interviewed so far include Marty DeLoach, who was fired from his job as Brighton's fire chief this year; Bernie Becker, who left his job as fire chief in Clearcreek Township, Ohio, amid a firestorm of allegations that later proved to be false; Harvy Holland, a battalion chief in Pontiac; Jeffrey Hawkins, fire chief in Pontiac; and Joe Dziuban, who retired in 2007 as Saginaw's fire chief. Sources say Becker and Dziuban are the two finalists being interviewed. City records show the fire chief was budgeted to earn a salary of about $117,000 this year, while two assistant chiefs were to make about $85,000 and $86,000. With benefits, the chief's total compensation comes to $169,424, while that for the two assistant chiefs each come close to $130,000. Assistant Fire Chief Greg Hollingsworth, the fire department's acting chief for the past few months, has submitted his paperwork to retire effective in February. "I've been with the department for 27 years, and with the new fire chief coming on board, I just thought it was time to make room," he said. "I've been thinking about retiring for a year or so and I just thought it was timely with them trying to cut employees. Maybe it'll make a difference. Maybe it'll save one layoff." Before he leaves, Hollingsworth has been asked to come up with alternate plans for restructuring the fire department if it has 14 fewer firefighters. He said that's a difficult task, and he hopes the cutbacks don't have to be implemented because it would involve taking one of the department's trucks out of service. The fire department currently has two trucks downtown and one at each of its four substations. Hollingsworth said the leading idea is to take one truck out of the downtown station, but that leaves a heavy burden on the one crew that would remain there. The alternate option of taking a truck out of one of the substations and closing that substation also isn't ideal, he said, because it would mean longer runs to whichever district becomes vacant. "Everybody deserves timely responses when they have an emergency so it's hard to decide," he said. "I would like to keep all the fire stations open." Ryan J. Stanton covers government for AnnArbor.com. Reach him at ryanstanton@annarbor.com or 734-623-2529.